Finally! 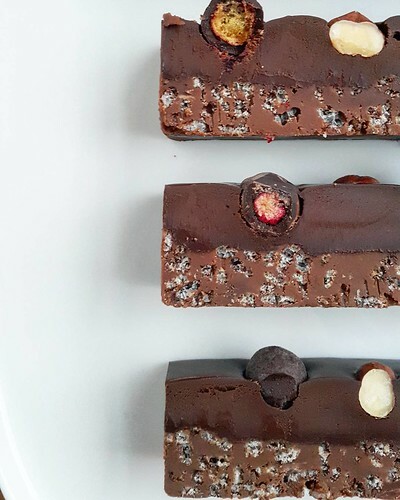 A gluten free version of my most requested hazelnut chocolate crunch bar for you all! Be warned: it is as addictive as the normal version and super easy to make. No baking required. 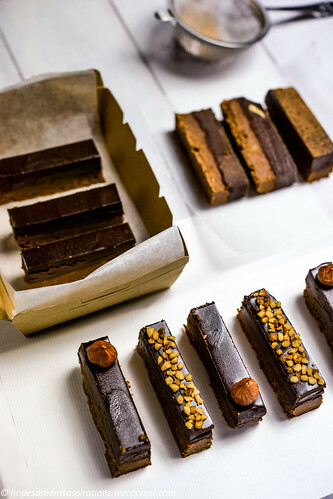 What makes these chocolate bars so irresistible? Two things: the hazelnut taste and the cocoa pops crunch. I tested many different type of gluten free cocoa pops before I was finally satisfied with the taste and texture. I settled on Hubbards’ Thank Goodness Gluten free cocoa puffs. These stayed completely crunchy! 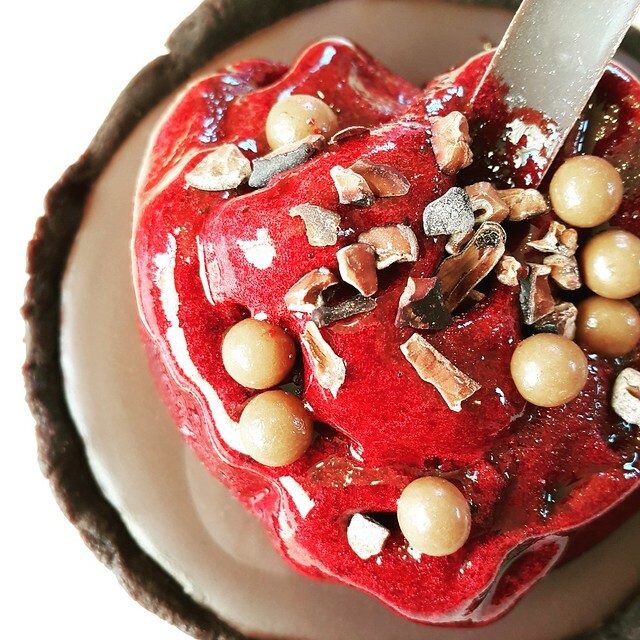 Regarding the hazelnut-chocolate combination, you can certainly change it to suit your latest cravings. Think peanut butter, salted caramel, macadamia butter, almond cacao and also peppermint to name a few. 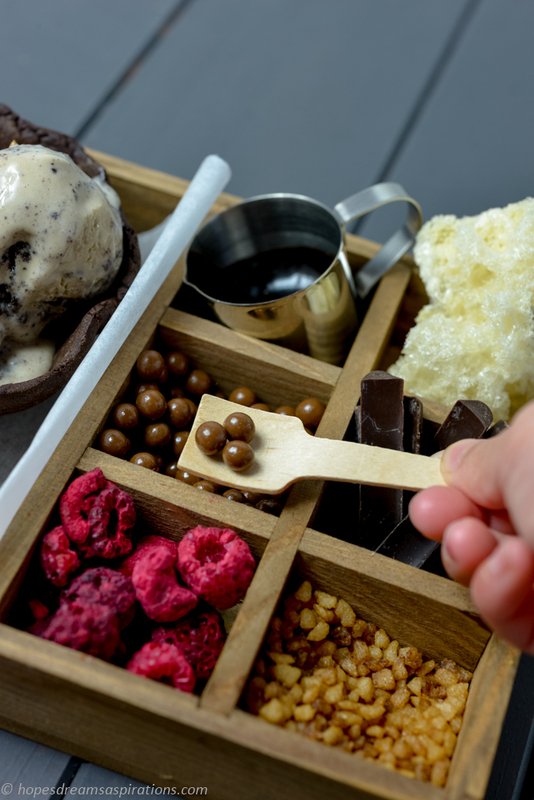 You can dress the bars up with whatever you like: a dusting of cocoa powder; hazelnut; hazelnut praline crunch; fresh-dried berries. Or left naked. Your options are endless which makes this an ideal ‘bring-a-dessert’ that *potentially* satisfies everyone. Melt chocolate over a pot of simmering hot water. Once smooth, add the roasted hazelnut paste and chocolate-hazelnut spread; stir until smooth. Fold in the cocoa puffs until the chocolate is combined (It should look like a mess!) Scoop the chocolate mixture to the prepared tray. Press the mixture down into a smooth, even layer. Let it chill in the fridge while you make the filling. To make the top layer, place the broken chocolate pieces in a heatproof bowl. Heat the cream till it is just simmering and pour over the chocolate. Shake the bowl a little and let this sit for about 2 minutes, this is so that the chocolate melts smoothly, avoiding any lumps in your final product. Add the cubed butter and whisk until ganache is smooth. As you whisk, the cream will magically homogenize with the melted chocolate to form a shiny smooth, pourable ganache. Pour the ganache over the cocoa puffs and smooth with a spatula. Leave in the fridge to set, about 1 hour. 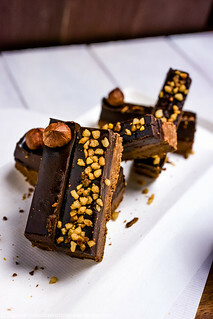 Decorate with whole hazelnuts, hazelnut praline crunch, freeze dried fruits or anything you wish! Place in the fridge to set it a further 2 hours. Slice into bars before serving. Styled by my little chef. 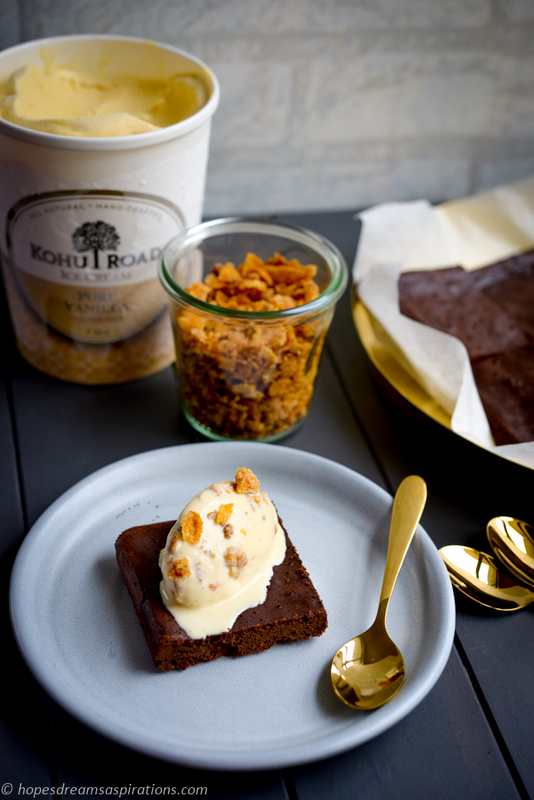 Having made a delicious salty-sweet combo out of my cornflake crumble and Kohu Road Pure Vanilla ice cream, I needed something to serve it with. Cookie sandwich was an obvious contestant, but I had a particular picture in mind. I wanted something light but not cakey, rich but not heavy. I need, a mousse cake. More so, I need a Darren Purchese cake. I’ve adapted the recipe from Lamingtons and Lemon Tart as follows. *this proportion when baked in a square tin will produce a beautiful but rather thin (1.5cm) cake slice. If you would prefer a thicker slice, double the amounts and bake for 1 hour 15 mins. Preheat the oven to 150C. Line a square baking tin with baking paper with enough overhand to lift the cake once cooked. Spray the paper lightly with rice bran oil. 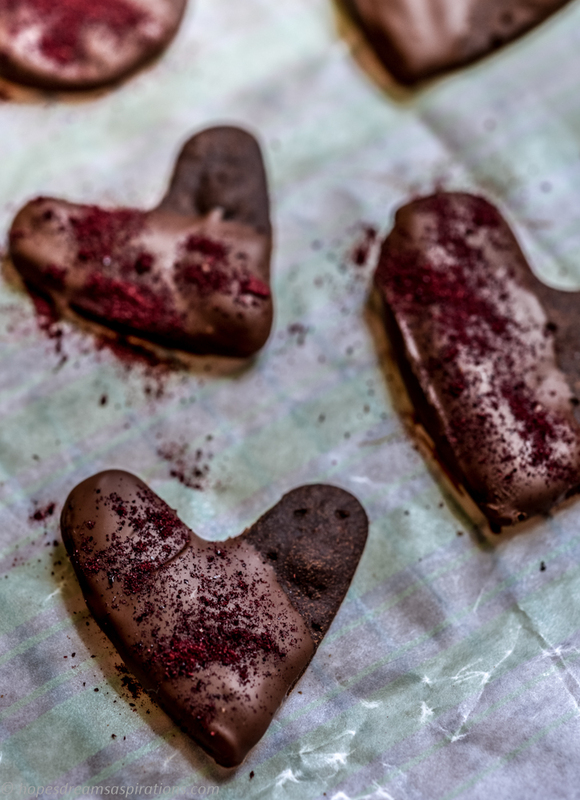 Melt the chocolate in short bursts in the microwave (2 mins should do it). Whip cream till thick and fluffy. Whisk the eggs, yolks and sugar together until thick and pale. Gently fold half of this mixture into the melted chocolate, then fold in the remaining egg mixture. Pour mixture into the baking tin. Cover with foil and bake in the oven for 50 minutes. Remove from oven and leave cake to cool completely before chilling in the fridge for at least 2 hours. Lift cake by the baking paper and cut the cake into squares. This is best served warm with ice cream or milk. Perfect for Mother’s day afternoon tea or dessert. 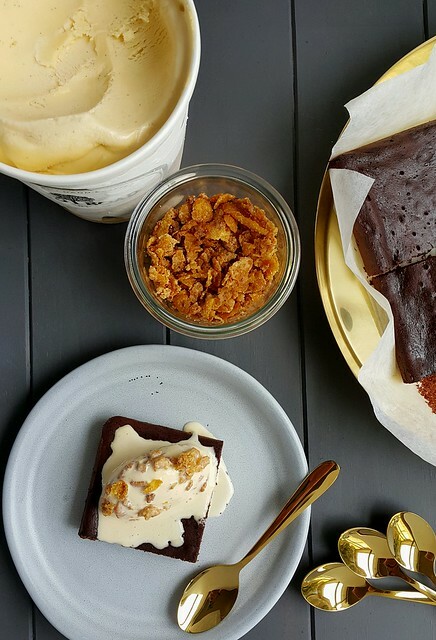 There are times when you want a fancier dessert for a special occasion. Think entremets but no time to make mousse, sponge, crispy layer and mirror glaze? This is where you need joint forces of best quality products. Make a delicious chocolate tart with handmade pastry (Paneton Bakery) and ganache with good quality chocolate. 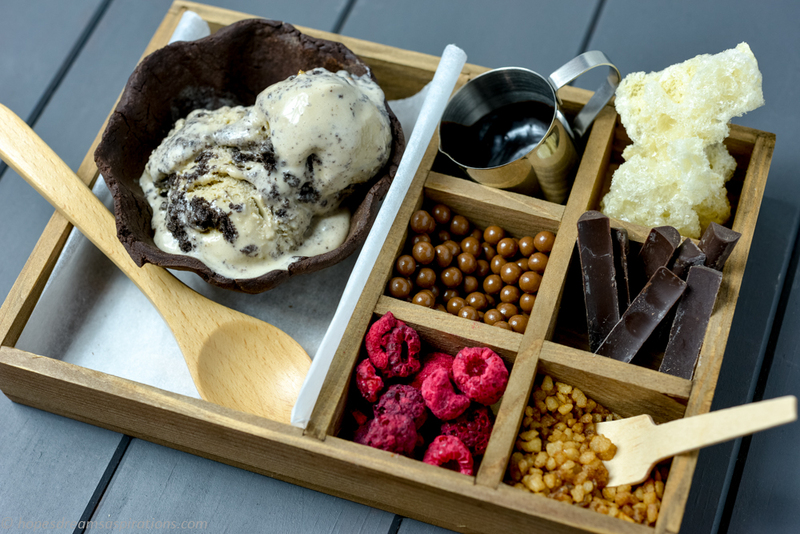 Dress it up simply but elegantly with a big scoop of good quality ice cream or sorbet on top. 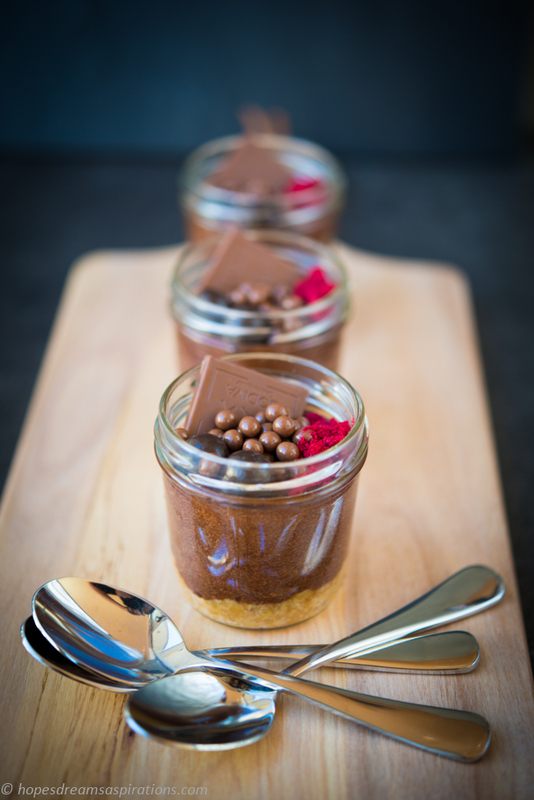 Decorate with chocolate pearls, chocolate shards, cocoa nibs and cornflake crumble for extra crunch and texture. Voilá! Here I’ve paired it with Kohu Road‘s Cassis sorbet, simply delicious! 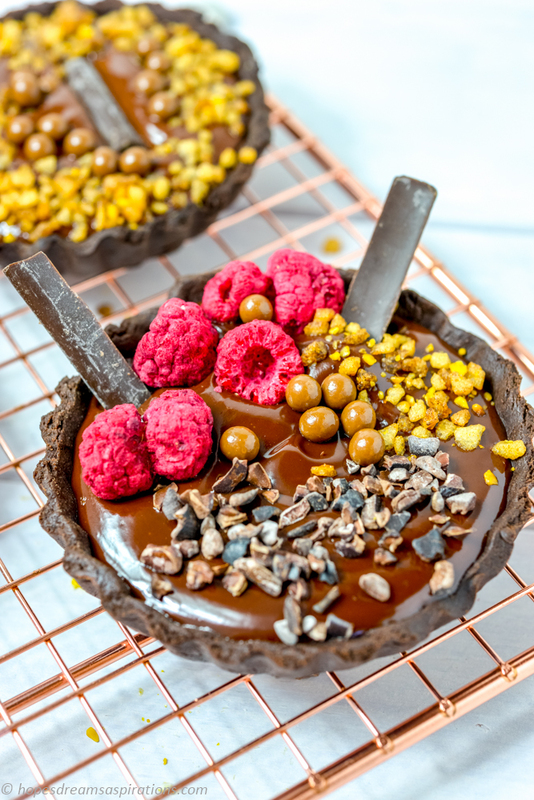 See my earlier post Chocolate Tarts for the recipe for an easy chocolate tart. After years of trial and error, I’ve finally got a fail proof chocolate brownie that appears to satisfy the fussiest and hardest-to-please of all critics (aka Miss 8). 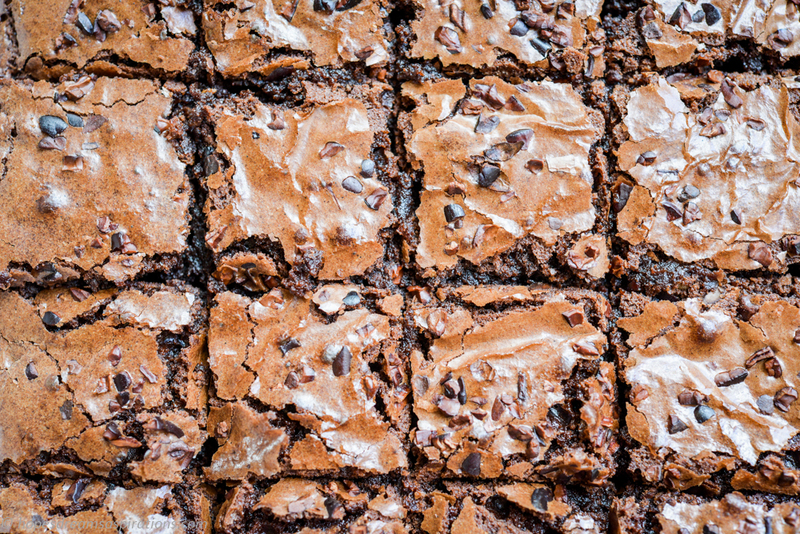 These brownies are fudgey and chewy, just how we like it. Best served warm with cold milk or ice cream! Preheat oven to 180C fan forced. Grease a 20cm square cake pan and line with baking paper. Place butter and chocolate in a heatproof bowl over a saucepan of simmering water. Stir with a heatproof spatula until melted. Remove from heat and quickly stir in all your ingredients, except the toppings, until just combined. Pour into the lined pan. Sprinkle in your choice of cocoa nibs, hazelnut praline or extra chocolate chips. Bake for 28 to 30 minutes or until the toothpick test comes out with moist crumbs on the stick. Set aside to cool completely before removing from pan. 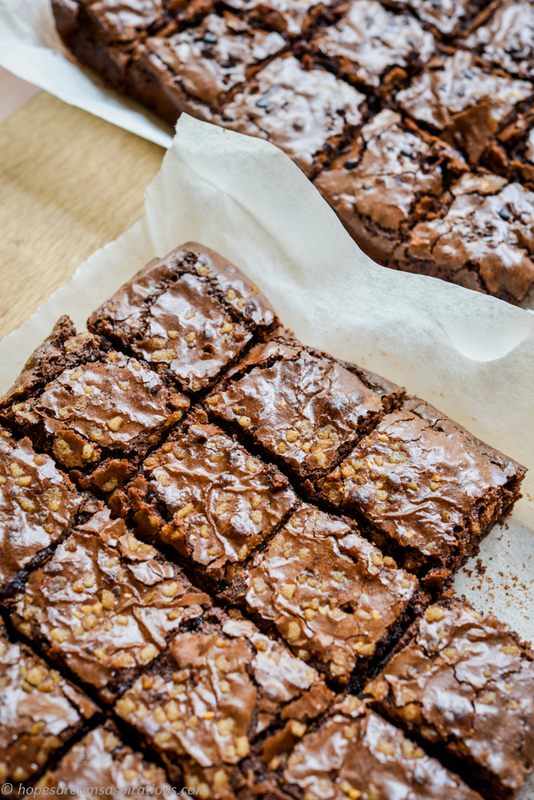 The secret here is the combined use of dark chocolate and cocoa powder, and with less sugar than normal brownies. 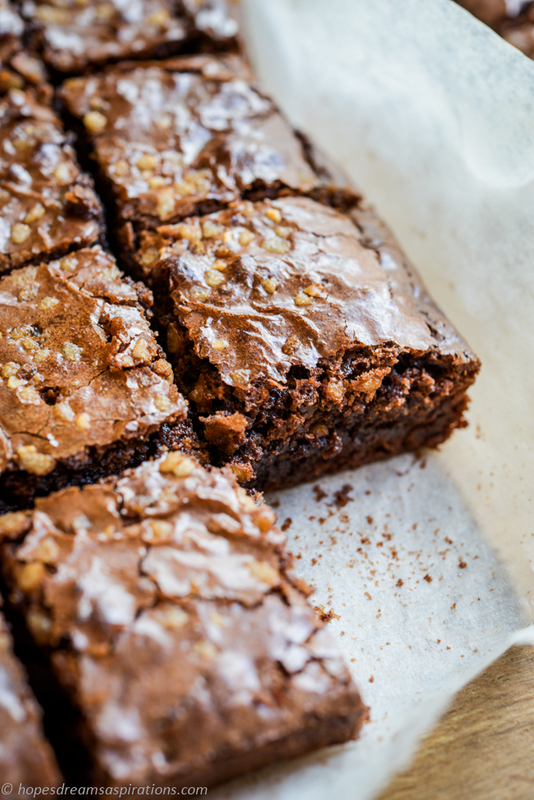 This makes it distinctively brownie, not cake. I hope you will love this as much as we do. These are perfect for school bake sales or bases of entremets. You can easily make more and freeze whole slices in two layers of foil and an air-sealed bag. If you have ever tried making short crust pastry, you would know that while it isn’t very difficult (at least when compared to making puff pastry), it does take a bit of time to make and rest before you can roll it out for baking. 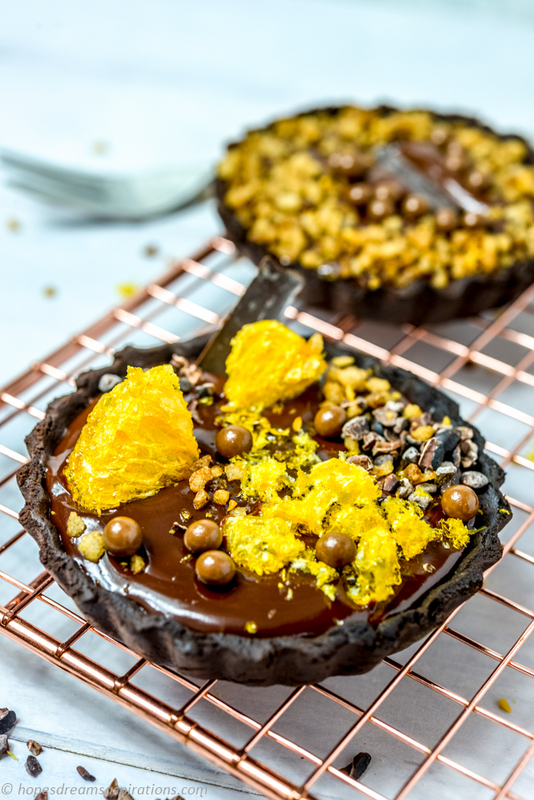 Add to that my preference for a chocolate shell to go with a dark chocolate ganache – I end up making far fewer tarts than other desserts. Thaw pastry overnight in the fridge. Using a sharp knife, cut out squares or circles of pastry to fit your tart mould. Push the pastry into the moulds carefully, be sure to mend any breaks. Prick the pastry all over with a fork. Blind bake in 180C oven for 9 minutes. Let cool on a rack. Make ganache by heating cream in a pot till just starting to boil, then pour over the the chocolate pieces. Let is sit for a minutes for the chocolate to soften, and then mix it till the mixture becomes glossy and thick. If using nut butter, add a dollop onto the baked shells before the next step. 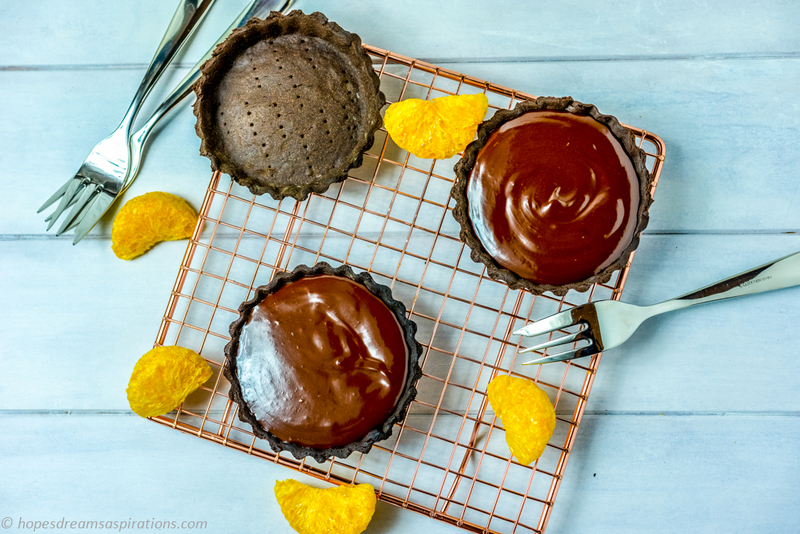 Pour ganache into individual tart shells, and decorate! Scoop the ice cream into a flat container and refreeze to solidify the ice cream again. 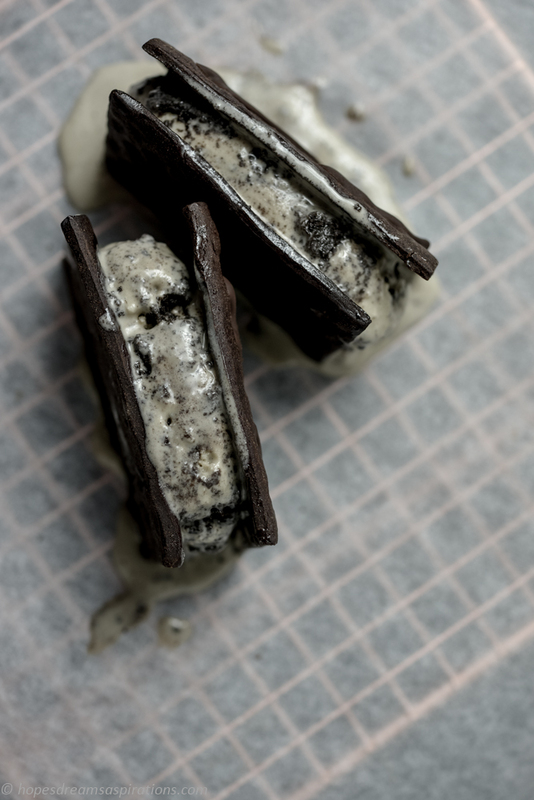 Cut out rectangle slices of ice cream and sandwich them between rectangular shaped pastry cookies. J made some rocket ship and butterfly biscuits here with cookie cutters. 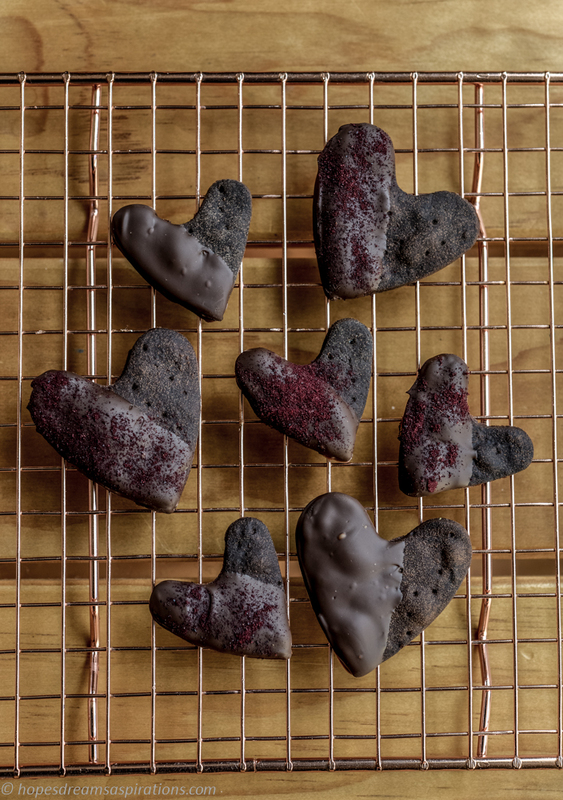 We then dipped them into melted chocolate, followed by a sprinkle of Fresh As freeze dried raspberry powder. The acid tang was sooo good with the bitter pastry biscuit. Instead of lining the whole mould with the pastry, place a disc of it on the bottom of the mould. Bake and after cooling, pour in your favourite no-bake cheesecake filling (see my Tim Tam cheesecake) and let it set in the fridge. Hope this gets you going with your adventure using Paneton’s Chocolate Pastry!